Calling all Customer Trailblazers! Salesforce is bringing the fun, innovation, and giving back of Dreamforce to New York City with Salesforce World Tour, and the best part is, you can experience it from anywhere! Join us Thursday, December 15th, on Salesforce Live for a front-row seat and watch live coverage all day long. On December 15th, join thousands of your fellow Customer Trailblazers online for a game-changing keynote led by Marc Benioff (with surprise guests!) as well as innovative product keynotes. You’ll also hear from our friends at the Leukemia & Lymphoma Society and Deloitte Consulting and learn how to connect with your customers in a whole new way. 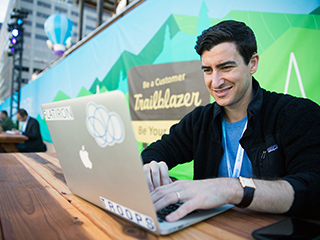 Follow #SalesforceTour and @Dreamforce for programing updates. 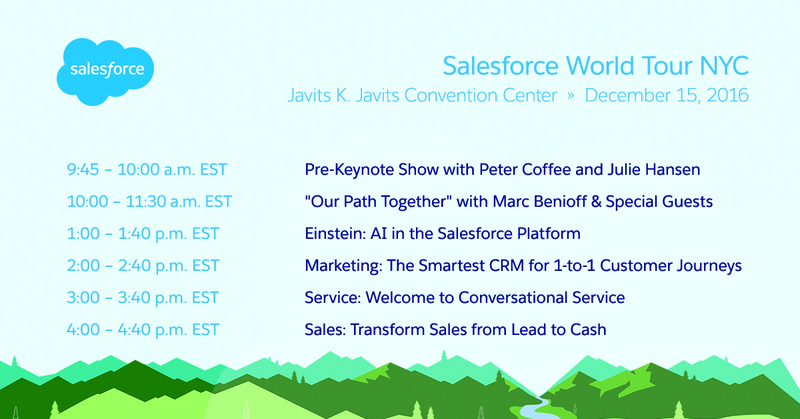 Watch Online with Salesforce LIVE View the complete Salesforce LIVE schedule below, and don’t forget to watch live on December 15th! We’ll be bringing you a high-touch experience for Salesforce World Tour on all our social channels. Be sure to follow Dreamforce on Snapchat, Instagram, Twitter, and Facebook to get behind-the-scenes content, tours of the Campground floor, discussions with thought leaders, and more. You might even get to see some of your favorite Salesforce mascots. Who are you most excited to meet? Let us know by Tweeting #MeetAstro or #MeetEinstein. You can also ask your questions or make comments on Twitter and get real-time responses. From the comfort of your couch, get access to keynotes, live engagement, and more. The keys to customer success await you online. A big part of Salesforce is giving back. Salesforce.org supports organizations that are working to build a more skilled, diverse, and equitable workforce. We are thrilled to be partnering with both Year Up and the Children’s Aid Society for the New York City Salesforce World Tour. At the event, we are partnering with Year Up by encouraging attendees to share career tips or lessons learned with a young adult aspiring to enter the professional world. Salesforce.org is also working with Children’s Aid Society. This New York City-based organization helps children in poverty to succeed and thrive. This is done by providing comprehensive support to children and their families in targeted high-needs New York City neighborhoods. The best part? You can give back to the community from anywhere! Salesforce is supporting the Children’s Aid Society by asking attendees to support children in need–donate what you can online!